That’s what we’re talking about today. How to discover your gap and determine how much you’ll need to retire. 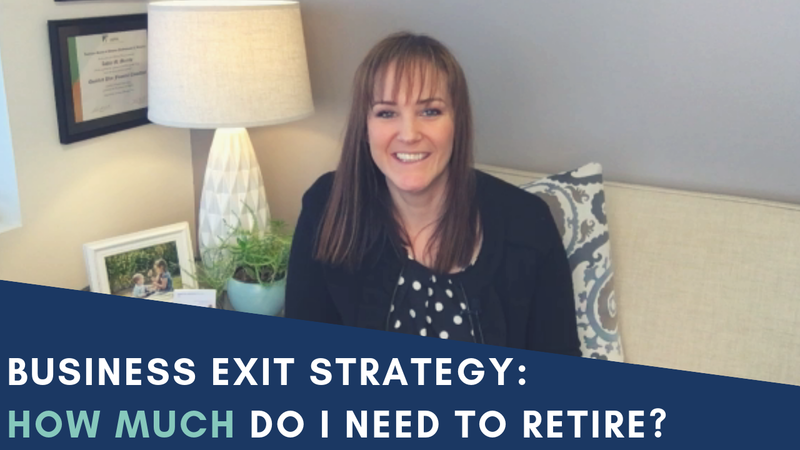 Business Exit Strategy – How Much Do I Need To Retire? My name is Ashley Micciche and I’m the CEO of True North Retirement Advisors where we specialize in helping business owners transition out of their business, successfully exit their business and retire. We do investment management, financial planning, 401k employee benefit plan consulting and exit planning. We’ve got two best friends. They’ve been business partners, buddies for the last 30 years. They have a very successful business and this business is worth about 1.5 million dollars. Jerry and George own the company. They’re split down the middle so they each own 50/50 in this business. Jerry is a bit older than George. He wants to retire about five years prior to when George wants to exit the business and he’s pretty close to getting to that point. We need to figure out Jerry’s gap. First, he has his business that’s worth about $750,000, his share of the business. But that’s the pretax value. Once Uncle Sam comes in, once the taxes are taken care of, I’m being generous in assuming he’s going to have about $600,000 after taxes. Jerry has also been a very diligent saver and investor over the years and he has a portfolio of about 2.7 million dollars. When you combine the value of his business with his investment portfolio, you get a total net worth of 3.5 million dollars. That’s pretty good! He’s done well for himself by pretty much any standard. What I really need is probably about $225,000 pretax. So there are a lot of ways to get at this number. But Jerry says, you know what, before taxes, I need about $225,000. He has a rental property. It generates about $18,000 of income for him every year. He’s going to receive social security because his income has been so high, pretty much the top tier, top income rate. His portfolio income, he’s going to be able to draw about $134,000 out that first year to sustainably make that last through retirement. Here’s the problem. I add up all those income sources and I don’t get to $225,000, I get $185,000. So, we now know that Jerry has a gap! Now the beauty of this, is that knowledge is power. Once we know if there is a gap and know how big that gap is, we can start to take steps both on the personal side and the business side to start closing that gap. What is the realistic income that I’m going to need in year one of retirement? And you can either do that pretax like I’ve done here, or you could do an after-tax figure as well. It doesn’t really matter. The important thing is to understand what you’re going to need. A big part of that is just tracking. If you don’t really know, start tracking your expenses. Keep track of where your money goes every month, how much you really need to pay the bills, how much you need for discretionary things, travel and other things like that. The very first step in discovering your gap is going back and taking inventory, both of what your personal assets are worth and your business. Find out what your business is worth. In the very first video in this series, I talked about how you can go about doing that. We have a free checklist with eight pieces of information that you can enter in to the free business valuation tool. This information should be at your fingertips. This is revenue, pretax income (what you pay yourself), officer compensation, and five other metrics. So it’s a total of eight metrics. You gather that information and then you can go and value your business. We make the valuation tool free – no strings attached, to allow you to see what your business is worth. Because until you know what your business is worth, you really can’t take these other steps in figuring out what your timeline is and how big your gap is. All the tools you need to value your business are right here! 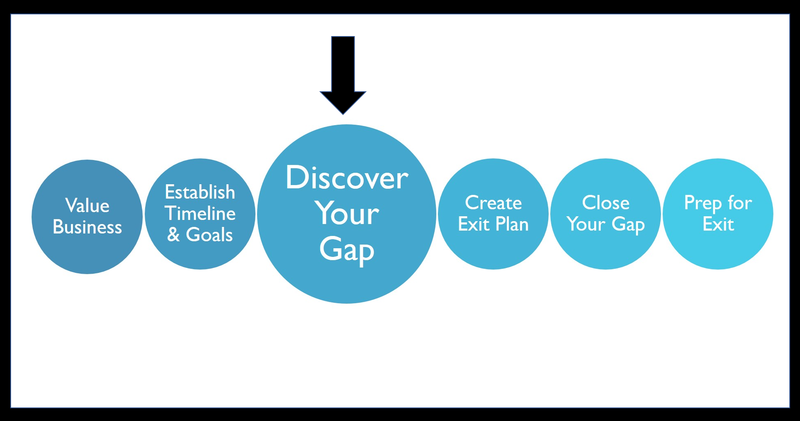 After you value your, business, understand your timeline and your objectives, figure out what that gap is, the exit planning process then diverges from here. From here, we go towards implementing these things that are going to help close the gap and taking further steps to identify a successor depending on who that successor will be. Thank you so much for reading. This is only part three of a seven-part series where we’re outlining the major steps that it’s going to take to exit your business. Stay tuned for the next Business Exit Strategy: How To Create Your Business Exit Plan.